UNITED NATIONS, November 22 -- There were two votes on the human rights situations in Syria in the UN General Assembly's Third Committee Tuesday morning, and they differed from each other and in interesting ways from previous Security Council votes. 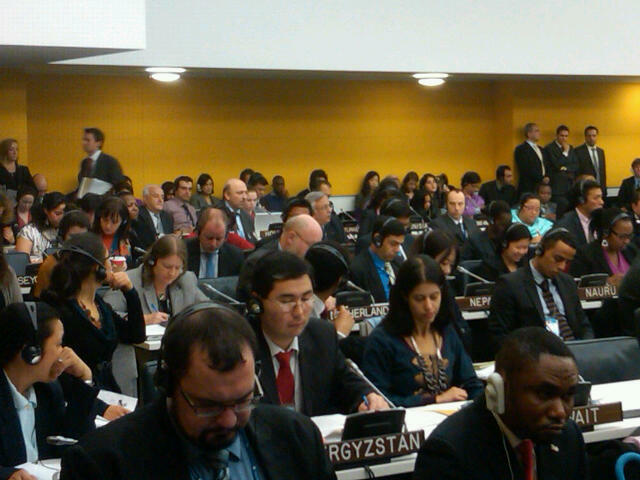 First came a motion by Syria to adjourn the meeting before voting on the resolution. Russia and China voted in favor of Syria's motion, while South Africa voted against it. Brazil and India abstained, and Lebanon didn't vote at all. Syria got only 20 votes in its favor, and 29 abstentions. While the content and stakes of Security Council and General Assembly resolutions are different, it's difficult not to notice that Russia and China which double-vetoed the Security Council resolution both chose to abstain in the General Assembly. And that Brazil which abstained in the Security Council this time voted yes. Does this reflect the continuing crackdown in Syria, the vote of the Arab League to suspend Syria or something else? Watch this site. The UN which granted a US request to televise the Fifth (Budget) Committee did not televise Tuesday's Third Committee vote on Syria. The UN did, by contrast, television a Rio +20 "global conversation" by Secretary General Ban Ki-moon, a sort of mock press conference complete with master of ceremonies, click here for that story. The North Lawn conference room where the vote took place was so full they ran out of translation sets. Saudi Arabia was, somewhat ironically, one of two speakers against Syria on the its motion to adjourn. We hope to have more on this.